Power supplies included. Quantity discounts apply for orders of four or more panels. 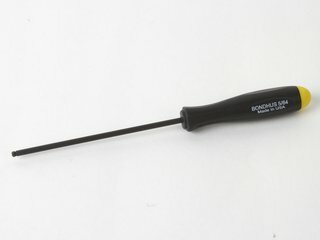 Fully assembled and tested; just plug it in to the provided power supply. Prices include one power supply for every 12 panels. Choose from US, EU, UK, or AUS cord styles. Volume pricing is also available; please contact us. 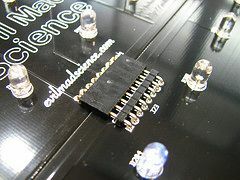 Interactive LED panels are also available as soldering kits; please see this page for more info. 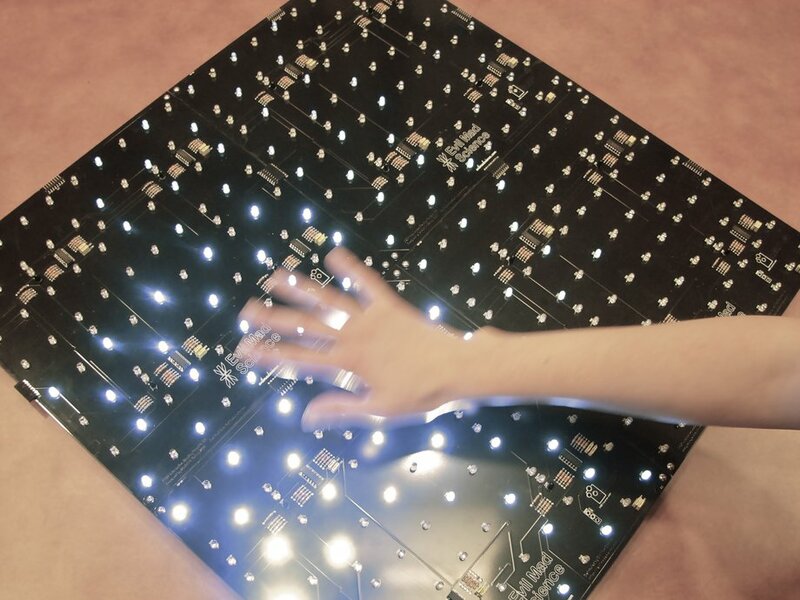 Interactive LED Panels are giant circuit boards filled with superbright LEDs that respond in a complex, subtle, and gentle fashion to stimulus provided by human interaction. 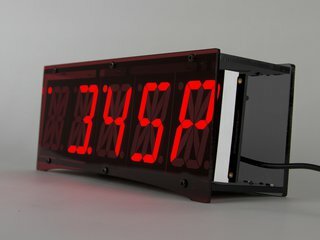 They can be used as interactive art on your wall, or tucked under glass to make your own Interactive LED Coffee Table. The best way to get the idea is to watch a video and see how the panels behave. The LEDs in our Interactive LED Panels are normally dim and constant-- the most you'll see in a dark room is a faint glow of twinkling like the night sky. But when you set your glass down on an interactive table, the table "sees" the motion, and induces a slight ripple starting in that location that can spread out to other areas as it dissipates. The overall effect is a bit like touching a pool of water, in that your local disturbance turns into an overall gentle rippling, and eventually settles down. It is decidedly not a disco floor-- there is not any blinking, programmed oscillations, or for that matter, any digital electronics at all-- the circuitry is completely analog for improved aesthetics and reduced eyestrain. The panels work well under clear or frosted glass or plastic surfaces, and work in light conditions from darkness to sunlight. 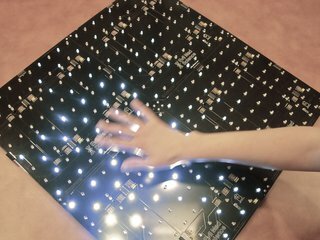 Interactive LED Panels are black, 12" x 12" (about 305 mm x 305 mm) square, with 80 ultrabright white LEDs arranged on a regular grid. Each has four motion sensor nodes, each of which controls 20 of the LEDs. 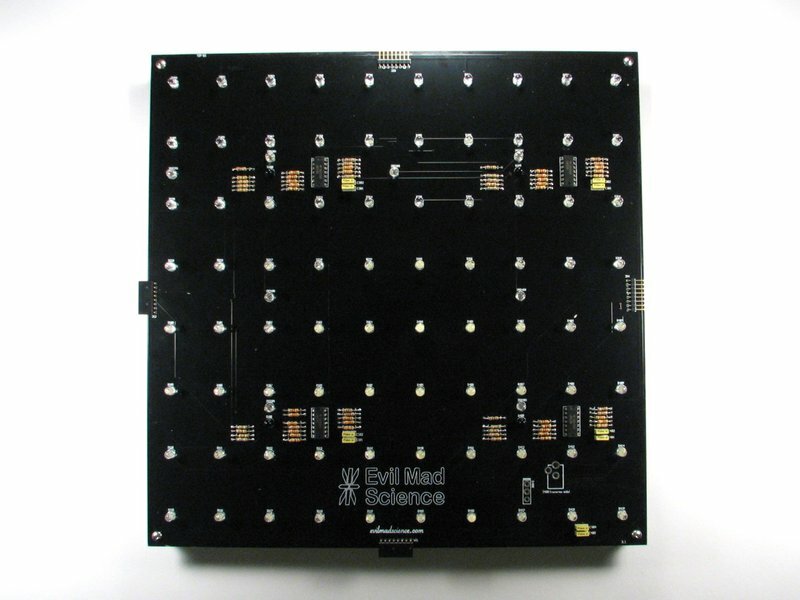 So, a 6-panel setup covers six square feet of area (1x6 or 2x3), has 24 sensors and 480 LEDs, while an 8-panel version has 32 sensor nodes and 640 LEDs. 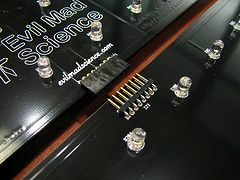 We use plug-in plug-out connectors to each board edge making it easy to reconfigure the panels in any rectangular arrangement. Interactive LED Panels are essentially stand-alone devices. 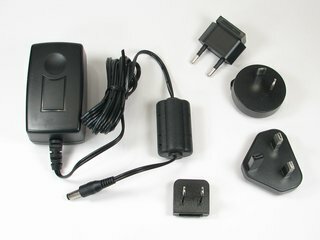 They require power to be provided but no computer or other external control is needed. Neighboring panels that are seamlessly connected together through their edge connectors can share power and communications between sensor nodes. Our standard power supplies can provide power to up to 12 panels. 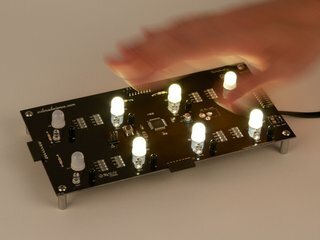 Larger numbers of panels can also be connected together if you wish to build a larger display; instructions on how to do this ship with the panels. You can mount these panels on a wall, in a coffee table, or on facing sides of a hallway, for an interesting art project. 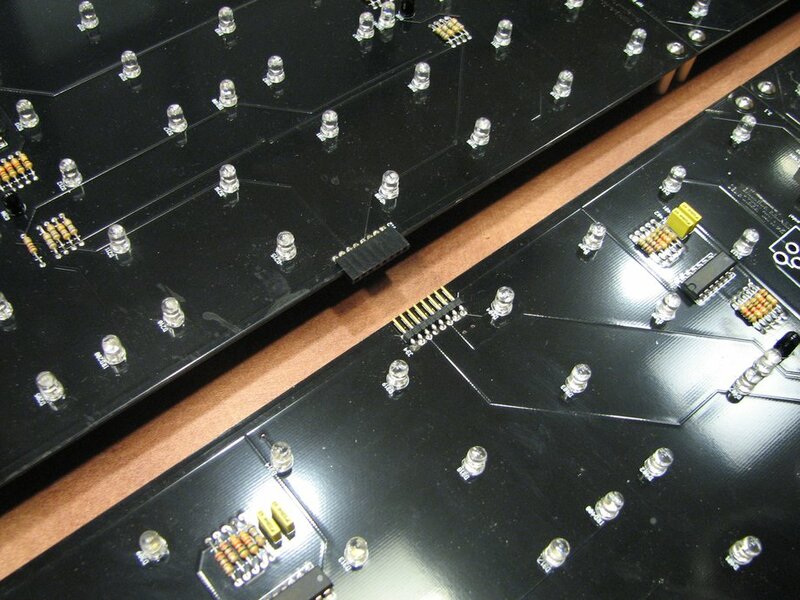 Preassembled panels come with mounting standoffs and brief usage instructions, including dimensions and notes about how to connect panels together for small and large installations. A set of n panels can be deployed as one block of n panels or as up to n smaller blocks of panels in different locations, so long as you provide an additional power supply for each block. 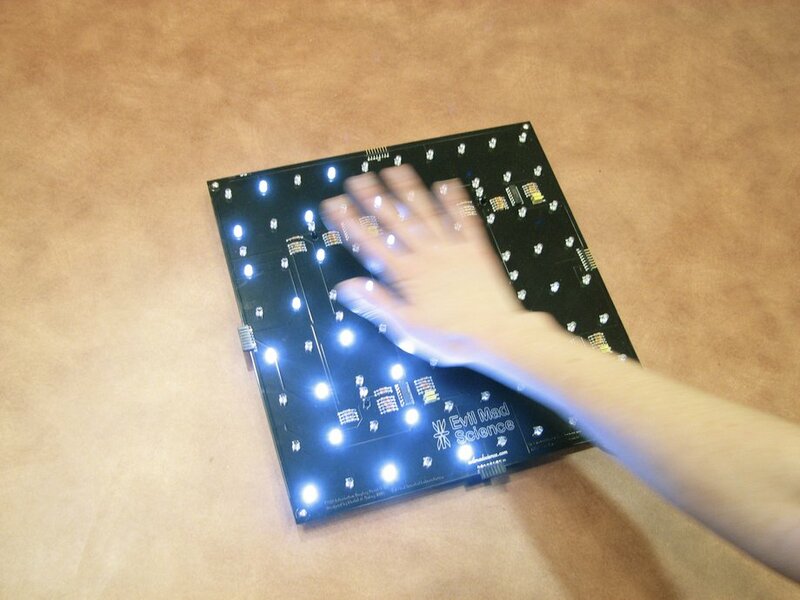 For example, an order for 8 Interactive LED Panels will ship with one power supply that can power all 8 panels. However, if you want to install them in two separate 2x2 (4-panel) tables, you should order one extra power supply, capable of powering at least 4 panels. 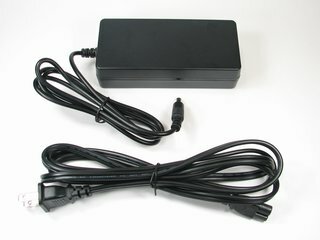 The power supplies are compact 24 V DC adapters. Our "Large" power supply (actually quite compact) powers from 1-12 panels. It accepts US or international AC power and comes with your choice of US, UK, EU or AUS line cord. If you are providing your own power source, it should be 24 V DC, well-regulated and capable of supplying at least 200 mA per panel. 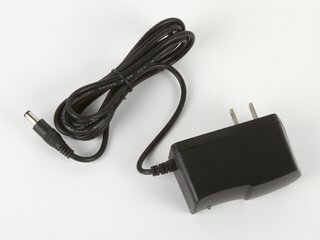 Do not power more than 12 panels from a single power supply; the inter-panel connections are designed for 2.5 A maximum. Our panels are energy efficient and typically use 1 W or less in the steady state-- under 8 W for a full 8-panel table top. (Most of this power is used to operate the sensor network.) At maximum amplitude when heavily stimulated, power consumption can reach as high as 5 W per panel, or 40 W for an 8-panel set.